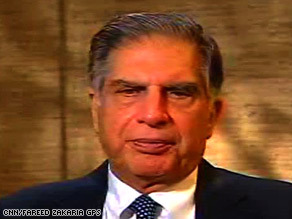 Watch the full interview with Ratan Tata on "Fareed Zakaria GPS" at 1 p.m. ET Sunday on CNN. Tata Group Chairman Ratan Tata, whose company owns the Taj hotel, discusses this week's attacks in Mumbai. But Tata Group Chairman Ratan Tata said those measures, which were eased shortly before this week's terror attacks, could not have prevented gunmen from entering the hotel. "If I look at what we had ... it could not have stopped what took place," Tata said in an interview with CNN's Fareed Zakaria that will air Sunday. "It's ironic that we did have such a warning, and we did have some measures," Tata said, without elaborating on the warning or when security measures were enacted. "People couldn't park their cars in the portico, where you had to go through a metal detector." "They knew what they were doing, and they did not go through the front. All of our arrangements are in the front," he said. "They planned everything," he said of the attackers. "I believe the first thing they did, they shot a sniffer dog and his handler. They went through the kitchen." Authorities carried out a room-by-room sweep in the 565-room Victorian building late Saturday to make sure that all guests had been evacuated and no gunmen remained inside. A. Vaidyanathan, an economist who was a guest in the Taj when the attacks occurred, told The Hindu newspaper on Friday that he had noticed tight security at the hotel when he stayed there last month. "First, when you enter the open parking, where the cars are parked, you had a very heavy metal frame; your baggage was searched," he said. "At the entrance of the foyer, there was another metal detector, and you were personally searched and so on." However, for this latest trip, he said, he could walk right into the hotel without encountering the same measures. Tata said the attacks revealed deficiencies in law enforcement, especially in the areas of crisis response and management. "We had people who died being shot through bulletproof vests," he added. "They seemed to know [the hotel] in the night or in the daytime," he said of the attackers. "They seemed to have planned their moves quite well, and there seem to have been a lot of pre-planning." Tata said the attacks underscored the need for law enforcement to develop infrastructure for crisis management, even if it meant seeking outside expertise for training, equipment and strategic operations. "We've been very complacent, because we've really not had this kind of terrorism inflicted upon us," he said. "We should not stand on ceremony to hold back. We should go to the best place possible to get expertise." Tata was hopeful that the attacks would unite Indians behind a common goal of preventing a similar tragedy. "Rather than have us succumb to this kind of terror, what it has done is given us a resolve that nobody can do this to us," he said. "We're indignant, but we're not scared. If there's a view that this has pulled us down, I think it will unite the country that much more." Tata said he derived those sentiments from members of his staff, who have pledged to stand behind him and restore the Taj to its former grandeur. "The general manager lost his whole family in one of the fires in the building," Tata said. "I went up to him today and I told him how sorry I was, and he said, 'Sir, we are going to beat this. We are going to build this Taj back into what it was. We're standing with you. We will not let this event take us down.'" Tata added, "And that is the feeling that they have, and I have a feeling that that's pretty much echoed throughout the country."